We encourage you to book your tickets online. The process is very simple, taking less than two minutes. How do I log in to my personal ticketing account? Go to “My Account” under Formula1.com > Tickets > Select any ticket-store > click on “My account” in the upper right corner of the ticket store and provide your log-in details. You can also find a direct link to your account here. Please note that the sign-in on the Formula1.com home page is dedicated to F1 Access only – you cannot access your Ticketing account from there. Log in to your account. Then navigate to “My Personal Information”. Here, you can provide a new password and save it. Where can I find the race timetable? Go to https://www.formula1.com/en/championship/races/2017.html and select the event of your interest, the race program is available for each Grand Prix under “Full Timetable”. When are the event dates confirmed? 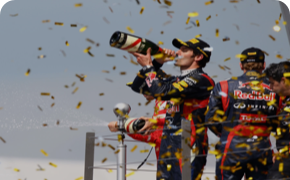 FIA must always confirm the event dates ahead of each season, which usually occurs in December. You can purchase tickets for the events that are open, even though the exact dates are not yet confirmed. If a date is yet not confirmed, this will be indicated by the text “TBC (To Be Confirmed”) next to the event date in the ticket shop. Please be aware that you are purchasing tickets for the event, and not for specific dates. How do I know whether the tickets I want are still available? If a certain ticket category is available, you will be able to choose your desired quantity and add it to your Basket. A « sold out » message appears for tickets that are no longer available. The message “Check quantity failed” appears when the number of tickets you have selected exceeds the amount we have on stock - please contact our Customer Care department by email or telephone if you would like further information. How can I find out the characteristics of a grandstand/tribune/loge? You can do this by clicking on « details » next to the stand name. The circuit/stadium map on the top right of the page offers you an overview of the stand locations as well. Click on the map to zoom in/out. Can I request a special seat? Selecting specific seats online is not possible. However, you can send us your request/preference when ordering tickets and we will do our best to satisfy your demand. Will my tickets have adjoining seats? Yes, all tickets in the same order will have adjoining seats. We can only guarantee adjoining seats for tickets purchased under the same booking. In case you have two or more orders, please contact our customer service team - we will indicate your preference in the order and do our best to accommodate your request. Please note that 3-day tickets and single day tickets in the same Grandstand are in most cases not automatically seated together. Please contact Customer service for further information. Are tickets for children available? Reduced-price child tickets are available for some events. Please contact customer service if you would like further information. For some events, you need to purchase parking tickets in advance. If available, you can usually find these tickets in the online ticket shop. Please contact customer service if you would like further information regarding parking tickets. How do I know if a grandstand is wheelchair accessible? Please contact customer service regarding tickets for disabled persons. After you have confirmed your order online, we cannot accept cancellations. Contact our Customer Care department for cancellation policies. Can I add tickets to my order after the booking has been processed? Yes, you can add tickets to your order if seats in your selected section still are available. Please contact us before placing an additional order, to ensure that we can arrange for your additional tickets to be seated together with your original tickets. We cannot guarantee that seats will be available, but will always do our best to accommodate your requests. Orders are not generally changeable. However, if you have a request please contact our Customer Care department by email or telephone. An e-ticket is an electronic version of a paper ticket. When e-tickets are issued for an event, you will find yours under the Ticket section of your account. You will be advised by email when your e-ticket is ready for download, usually 1-2 weeks before the event. The Basket, on the upper right-hand side of the « Tickets » page, is used for storing the tickets you reserve before proceeding to the Checkout. After adding tickets to your Basket, you can easily remove them or change the desired number. How can I add tickets to my Basket? Find the tickets you want, enter the desired number into the Qty field or choose the amount with the +/- buttons, and then click the Buy button. How can I change the number of tickets in my Basket? Click the button entitled « Basket » located on the upper right-hand side of the page. The content of your Basket will appear. Use the +/- buttons to change the ticket quantity. How can I remove items from my Basket? In the Basket area in the upper right-hand side of the page, click on the red cross next to the item you want to remove. Tickets are delivered by DHL for all events. When tickets are ordered close to the event date, the delivery method "pick up" is used. This means that you will simply have to collect them directly at the event. Generally, tickets are delivered by DHL approximately 3-4 weeks before the event. You will receive a tracking number once your order is shipped so you can track the package on DHL’s website. Can I provide a different delivery address? Yes. If you need your tickets delivered to an address other than the invoice address, please send us an email with details. Does someone need to be present when DHL delivers? Yes. DHL delivers tickets during the daytime, so please be sure to provide a delivery address where you or a trusted party can sign for the tickets during the day. The cost is based on your delivery address. The amount is automatically calculated when you enter your country on the Checkout page. How can I collect my tickets if my delivery method is “pick-up”? To collect your tickets at the event, you need to print your e-Voucher from your account (you will be advised by email once the voucher is ready to download, usually 1-2 weeks before the event), and present it to our pick-up team with your ID or passport. Details of the pick-up address and opening hours are printed on the e-Voucher. I want to collect my tickets at the circuit, but the option is not available on the website. If you need to collect your tickets at the circuit, please place your order normally and contact customer service afterwards. We can help you change your order to pick-up. Can another person collect the tickets on my behalf? Yes – If another person is collecting the tickets on your behalf, please kindly email our Customer Care with his/her name and last name. We will put a note in our system and this person will simply have to present the original Voucher and his/her own ID or Passport. We accept credit card payment and bank transfers. To pay via bank transfer, please contact us by email with your precise order request (be sure to include your full contact details and invoicing address) to receive an invoice. How safe is the payment using my credit card? Our payment platform is fully secured. An "SSL" (Secure Socket Layer) connection exists between your browser and the server. This means that data is transferred only after being encrypted and thus cannot be abused by third parties. Your personal data is only used to carry out your order. Our server guarantees the highest possible level of encryption currently available. Should you prefer not to transfer your data over the Internet despite our high security standards, we would be happy to accept your credit card information by telephone or email. When will my credit card account be debited? As soon as your order has been confirmed, your credit card account will be debited with the amount due as per your booking. When must the bank transfer be paid? Once you have successfully placed your order by email or telephone, an invoice will be emailed to you as a pdf file. The invoice states the date the payment is due. Why do you sometimes charge handling fees? A handling fee may be applied depending on the event chosen. Thus, in order to cover our costs and to be able to offer you optimum service, we need to apply a small percentage to the ticket price. Why is there a difference between the online value of the ticket and what I paid for it? We provide various currencies for your information in the Ticket-Store. However, the currency in which you are debited may vary. Information on what currency your order will be processed in appears on the payment page of the Ticket-Store. - Try again, perhaps with another credit card. - Fill out and return a credit card authorization form (available on request from our Customer Care department). - Contact your bank to check why the transaction was denied. Sometimes banks need to authorize international payments. - Contact our Customer Care department for assistance with the purchase. My order is in security check, what does it mean? This means that our credit card security system has detected an irregularity with your order. You simply need to supply our security department with the requested information. This check is to protect you from fraudulent credit card use. Orders will be confirmed as soon as payment has been received and confirmed. If the above information does not answer your question(s), please contact us at customercare@formula1.com.